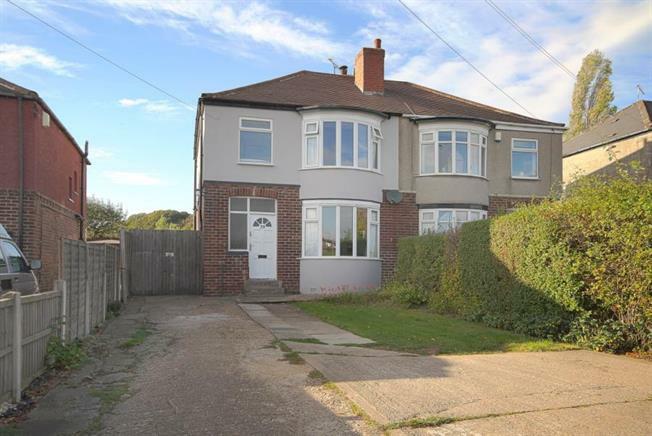 3 Bedroom Semi Detached House For Sale in Dronfield for £230,000. Not to be missed is this three bedroom semi detached property with garage, workshop, ample parking and beautiful views in the popular area of Dronfield. No onward chain. The property benefits from a range of local amenities and nearby schools. The property has been partly upgraded by the current owners and still offers scope to add your own finishing touches. Briefly the property comprises of an entrance door which leads into the entrance hallway with access into the kitchen/diner. There are a range of wall and base units to the kitchen area and the dining area has a wood burning stove and patio doors leading onto the rear garden. Double doors from the dining area leads into the living room with feature bay windows looking out onto the front of the property. This is an ideal space for entertaining. Also accessible from the hallway is the downstairs cloakroom with toilet and wash hand basin. Stairs lead to a landing providing access to the roof space which has a pull down loft ladder. There are three bedrooms and a family bathroom with under floor heating, wash hand basin, toilet and "P" shaped bath with shower above. Outside the property has been re rendered. To the front of the property there is off street parking for multiple vehicles. To the rear of the property the garden is on two levels one area having a patio and decking and the other which is mainly laid to lawn, has shrubs and backs onto fields. Viewing is highly recommended to appreciate the size of the living accommodation on offer.